Solai in Kenya where the mudslide happened. AT LEAST 27 people died after a dam burst in southern Kenya, sweeping away their homes while many of them were asleep, police have said. 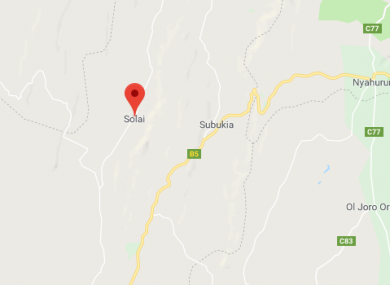 The private Patel dam, used for irrigation and fish farming, burst yesterday evening in Solai, near the Rift Valley city of Nakuru, regional police chief Gideon Kibunjah told AFP. “The search and rescue exercise is ongoing and more bodies have been retrieved. The death toll is now 27,” Kibunjah said. “We found 11 of the bodies covered with mud at a coffee plantation and these are people who may have been escaping but could not make it due to the force and speed of the water from the flooded dam,” he said. Most of them are women and children who could not have been able to run fast, and the elderly. Several villages were affected around Nakuru, Kenya’s fourth-largest city, as well as two schools. Government statistics released yesterday showed that more than 220,000 people have been displaced by flooding as heavy rains hit the country after three consecutive failed rainy seasons had left it in drought. The Red Cross appealed last week for $5 million (€4 million) to help those affected. Email “At least 27 people killed after dam bursts in Kenya”. Feedback on “At least 27 people killed after dam bursts in Kenya”.